Head of the plant's technical department, Bui Phuong Nam, said the second turbine would add power to the grid just four months after the first turbine started generating. By 2015, the Son La plant will have six turbines producing nearly 20 million kWh per day, helping ease the nation's power shortages. The 12 units include units 2, 3 and 4 of Son La Hydroelectric; unit 2 of Song Tranh 2 Hydropower; unit 2 of Dong Nai Hydropower; An Khe ; Kanak Hydropower; Dong Nai 4 Hydropower; and expanded Uong Bi Thermal Power Plant 2. Addressing the event, PM Dung stressed the significance of early operation of the first turbine and bringing the plant into operation two years ahead of schedule, saying this was not profitable for the country but also ensures a steady supply of electricity for production and people’s life, especially in the dry-season months of 2011. The Son La hydropower plant is not the largest of its kind in Vietnam and Southeast Asia, but also the first large-scale project designed, constructed, manufactured and installed by Vietnamese engineers and workers, he said. In the course of the week, a series of events will be organised, including an international trade fair, a tour to visit Son La hydroelectric power project, arts performance, food festival and competition for tour guides. 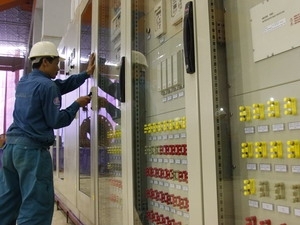 The first of six turbines at the Son La station was connected to the national power grid on Friday, said Hoang Trong Nam, director of the plant’s management board. He said the two-billion-dollar plant with a capacity of 2,400 megawatts is expected to be fully operational in 2012, three years ahead of a target set by the National Assembly. The 1,200 megawatt Lai Chau plant is located in northern mountainous Lai Chau province’s Muong Te district and in the highest step of the Da River’s escalading hydropower system, above the 2,400MW Son La plant in the middle and the 1,920MW Hoa Binh plant downstream. According to EVN, the new plant will supply some 4.7 billion kWh of electricity a year to the national grid, a significant amount for the country where demand is growing fast, at 13-15 per cent annually. The operation of the first turbine is expected to ease the country’s power shortages and pave the way for the completion of the remaining turbines in late 2012. 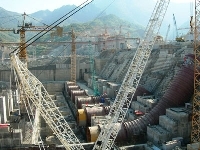 The Son La Hydroelectric Power Plant is designed to have a total capacity of 2,400 MW with six turbines, each of 400 MW. Vietnam’s north-western region covers 109,245 square kilometres and has a population of nearly 11.5 million. It is an especially important region in terms of national security and defence. 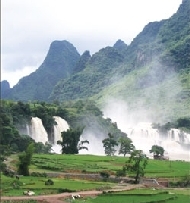 The region is home to 12 provinces - Yen Bai, Lao Cai, Lai Chau, Dien Bien, Son La, Hoa Binh, Phu Tho, Ha Giang, Tuyen Quang, Bac Kan, Lang Son and Cao Bang.